"It's always fun to dress alike." That's what one of the captions says for one of these pages, but is it really? Are these couples really having fun? We all know that lots of things should be coordinated...socks, for example. Perhaps earrings. But not couples. 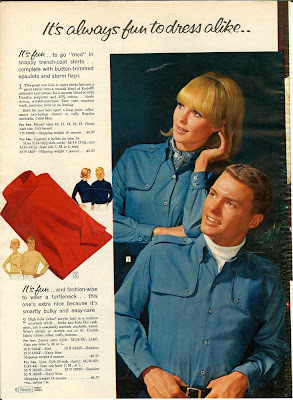 The strange vintage fashion trend of his and her matching clothing has been covered on many other blogs, but I couldn't resist posting these beauties from the 1966 Sears Wish Book catalog (you can find it and many others on the site WishBookWeb). 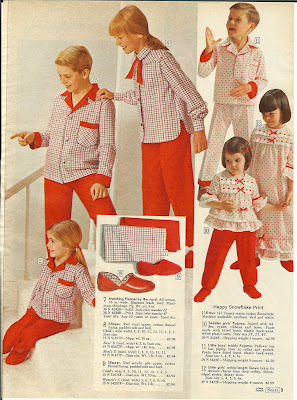 Many posts that I've seen usually pull images from the 70s, but this is scary proof that trying to dress like your partner seems to have originated a decade before. This begs the question of who started this nauseating trend, and why? They don't make you seem like a close couple - just close, maybe, to checking yourselves into the loony bin. It just looks like the type of thing you'd see Steve Carrell, Will Ferrell, or John C. Reilly do in a movie - and for added laughs, they'd do it with another guy! 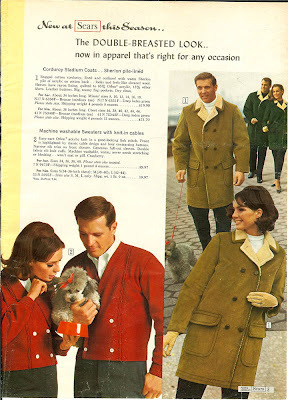 Thank goodness they did not force the dog to wear a matching doggie coat. Was the use of the Santa mask as a prop a distraction from the geekiness of these photos? Shouldn't there be two Santa masks, if they're really trying to match? This takes "I want to get into your pants" to a whole new level. 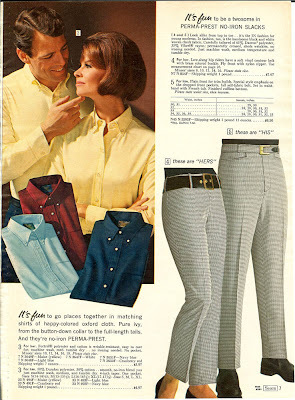 Now you really can be in your sweetheart's pants - even when you're not! Why should Mom and Dad have all of the torture? 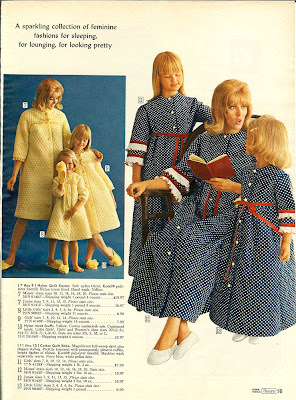 Force your children to also suffer. Even the slippers match. And the Holly Hobby type sleep caps? Ghastly. 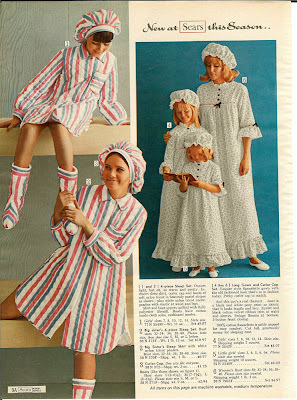 To be fair, this issue of the Sears Wish Book contained a LOT of colorful, groovy fashions. You just won't find any of them on the first ten pages. 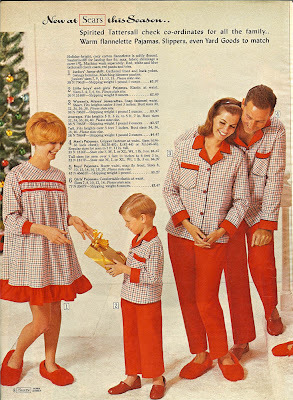 Pam - Those are some of the ugliest clothes from the 60s. 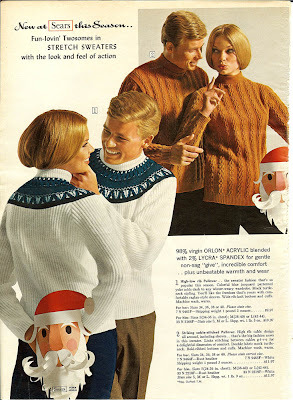 It seemed like as the younger generation went Mod and Hippie the traditional clothing just got drearier - just thinking that couples went out and bought two of anything there gives me the shivers, lol. 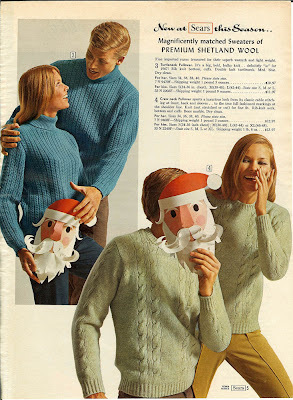 The only thing I like in those ads is that great paper Santa Mask! 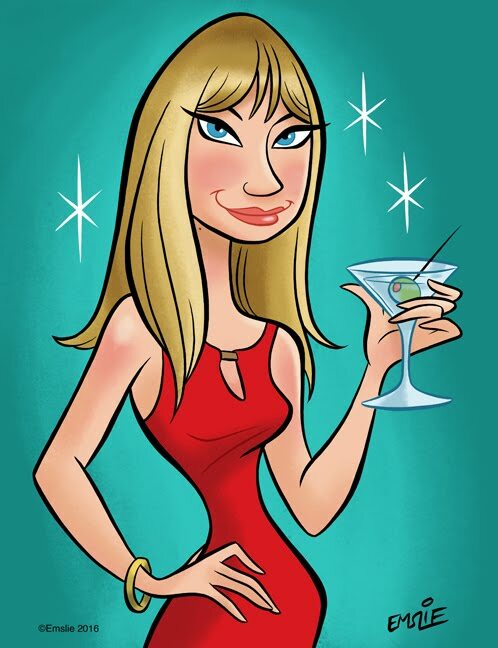 PopArtDiva™ Retro Blog and checking out The Beatles Christmas recordings. His 'n' hers matching clothes should be illegal! Some of those are truly terrifying! heinous! 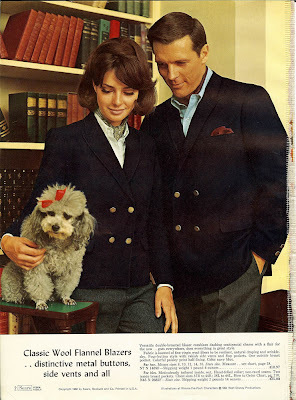 but i have to say the young woman in the ascot and blazer looks great. a lovely look. might have to try that myself. i do enjoy menswear-inspired clothes.